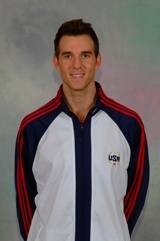 The son of Dr. Arthur Davis and Cheryl Davis, Arthur Davis became the first American Sports Acrobatics athlete, along with mixed pair partner Shenea Booth, to capture the gold medal and become two-time Mixed Pair World Champions in 2002 and 2004. A self-proclaimed individual who "strives to push himself as far as he can go until his path changes," Arthur has become one of the most decorated sports acrobatics athletes in the U.S. His athletic and scholastic honors and awards include: Athlete of the Year (USAG, 2004, 2003), Sportsperson to the Year (USAG, 2004), Highest Meet Score at Nationals, Best Choreography, Outstanding Base, most difficult skill competed at Nationals, recipient of the Glen Sundby Award for Outstanding Pair/Group Performance, a member of Who's Who Among High School Students and a role model for numerous young Sports Acrobatics worldwide. In 2003 Arthur and Shenea finished 1st All-Around in the Freedom Cup and 2nd at the Volkov Cup in Russa. Arthur's athletic vitae also includes four National Titles. An interesting note about Arthur is that he enjoys meditating, roller coasters, is an enormous Tori Amos fan and also studies alternative medicine. His role models include his parents, coach and mentor Youri Vorobyev, Michael Jordan and Andre Yakovlev.